In order to identify a possible Blayney ancestor, I have followed each son with known descendants, according to . He married Elizabeth Powell and begat Edward (~1597), John Blaney (~1598), Ambrose (~1600) and Richard (~1605). Another Thomas is listed in the LDS Ancestral File lists . See the other Thomas born 1585, also son of David Lloyd Blayney and apparently a separate person). alias Shane McKenna , although Thomas born 1585 could also fit! James City, Virginia in 1620 with 153 passengers and to barter the cargo for tobacco. collect 150lbs of the "best leafe tobacco" for each of the 50 plus "maids and young woemen"
1623 and 1625, going on to become a Member of Virginia's Governor’s Council 1626.
postulate Captain Edward Blaney (sic) as the son of Edward Blaney and Margaret (?). the middle "y" to enable Americans to spell it! The Blaney family genealogy summary (from John above) is now included on this page -see Blaney. Note 1 Captain Francis WEST (b.25Oct1586; d.Feb 1634), the second son (9th child) of Thomas West, 2nd Baron De La Warr (1618-?) and Anne Knollys, came to Virginia from England in 1608 with his 1st wife, Margaret BLAYNEY née REEVES [m. in Salisbury, b~1580/90], "widow of Edward Blaney (sic), whom he married prior to his leaving for Virginia in 1607" (or 1606 or 1608). Their children were Francis WEST [b.1606 (Salisbury, England); d.02Jan1691/92 (Duxbury, Mass.) ] and Elizabeth  who may have died young as the Francis West Will of Dec 1629 lists only one child. 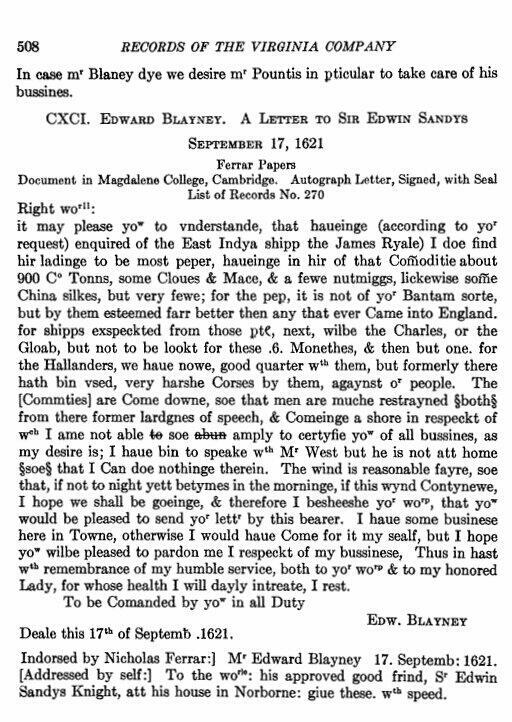 The first husband of Margaret, Edward BLAYNEY was born about 1585. To date I am unable to link him to a known Blayney, although Gizzard & Smith postulate this Edward Blaney (sic) was the father of Captain Edward Blaney . After Margaret died, Captain Francis WEST became the Hon. Colonial (Crown) dep Governor of Virginia (1627-9) and Captaine Generall and married Temperance Fleudieu, widow of Gov. George Yeardley but she died in 1628. He returned to England in 1629 then married Jane Davey, dau. of Sir Henry Davye before returning to Virginia by 1631. Therefore there does not to be any obvious link with Captain Edward BLAYNEY and Margaret BLAYNEY, wife of Francis WEST, Governor of Virginia .